Keep your fingers crossed, vote early, and vote often for Nathaniel. He's an amazing powerhouse of a singer--a sort of Boy George meets Rue McClanahan with epilepsy. We haven't seen his equal on Idol for years, and we need to keep him around. He is terrible. 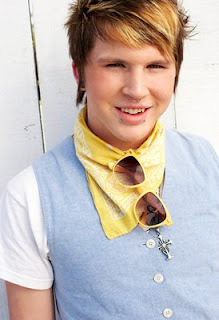 And his headbands are awful, along with the tattoos, piercings, highlights, femme hairstyle and terrible song choices. He must stay to the end. We need this sort of entertainment. I'm so glad we see eye-to-eye on this, Tipples. Darling send him back to the trailer park from wence she came and give us someone like Bing Crosby or Russ Columbo. He raped Meatloaf. He is no friend of mine.